Lose an Inch – Gain an Order! The SQ pump is Grundfos’ most compact submersible pump for ground water extraction. 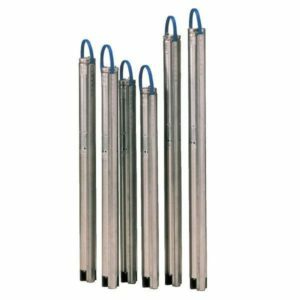 A mere 3” in diameter, the long, lean pump fits nicely into small boreholes of the same size – or in 4” boreholes that over time have become smaller. The compact design, along with key features like dry-run protection and soft start to reduce wear on motor, makes the SQ pump one of the most reliable choices for submersible operation. LOSE AN INCH . . .
At only 2.9” in diameter and a weight of only 14.8 lbs, the SQ submersible pump is extremely compact and ideal for all wells 3” and larger. In addition to the features and benefits shared with the renowned SP submersible pump, the SQ offers a number of motor protection and wear-reducing features that makes it the obvious choice for groundwater extraction for residential wells, for irrigation systems, or for groundwater lowering. In the big picture, this pump will save you time–and money! For all of these reasons, more and more pump professionals are turning to the 3″ Grundfos SQ pump. Contractors spend more time working on their business than pulling defective pumps. Contact Duff today to cross-reference the SQ pump from your 4″ pumps–the pricing is now right to make the switch!